I’ve recently shared that I’m a member of the U.S. Cellular Better Moments Blogger Brigade. When I was asked to join their team as part of this ongoing campaign I knew it was a good fit for me since I’ve been a happy and satisfied customer for many years. Not only that, but I’m also being compensated for my time and for sharing some exciting programs and features that U.S. Cellular has to offer, so really, everybody benefits. I was most excited to learn that I would receive the new Samsung Galaxy S4 for my participation in the program. For too many years I was using a Blackberry and let’s just say that making the switch was like going from a rotary phone to a cordless one. Seriously, I’m not sure how I can put into words how much this device has changed my life, but I’m going to try. Facebook – Who doesn’t have the Facebook app on their smartphone? I can update my status and stalk see what’s going on with my friends whenever I feel like it, plus I can control the notifications so my phone isn’t constantly chiming with new updates. Twitter – Twitter is another of my most favorite social media apps on my Samsung Galaxy S4. Just like with Facebook I can post an update, or tweet, right from my phone and see what’s happening with my friends and followers. Instagram – Instagram is possibly the app I was most jealous of before I had the Samsung Galaxy S4 since it wasn’t available on that old device of mine. I can snap and share photos with my followers there and most recently, videos too. What I like the most, though, is that when I post a photo on Instagram I can also choose to immediately share them on other social media sites, like Facebook and Twitter, which saves a lot of time especially when I’m on-the-go while traveling or at an event. Oh, and I can’t mention the Instagram app without mentioning how much I love the camera on this device. I might never travel with my digital camera ever again. No kidding. Earlier this summer my family and I spent a couple of days in Boston and I can’t tell you how much my Samsung Galaxy S4 enhanced that experience. From taking photos with the powerful and crisp camera, to using the Google Maps App to look up directions for places we wanted to visit, I found it to be the most valuable thing to carry in my purse. Well that and my lip balm. I’m in love with my lip balm. How cool would it be if there was an app for that? Oh, but I digress. Remember how I mentioned the Samsung Galaxy S4 is no ordinary smartphone? Well I wasn’t kidding because there’s one feature, well, really two features that will have you overflowing with envy. First, have you ever sat down and got comfy on the couch to watch television and realized the remote control was all the way on the other side of the room? If you don’t have a child or a well-trained dog to bring it to you then you know what kind of agony I’m talking about. If you’re like me, however, you most likely remembered to grab your cell phone before you sat down and got comfortable, right? Admit it, you know it’s totally true. Well thanks to some fancy new technology in the Samsung Galaxy S4 you can actually download an app that essentially turns your phone into a remote control. It’s called WatchOn and I’m in love with this app. 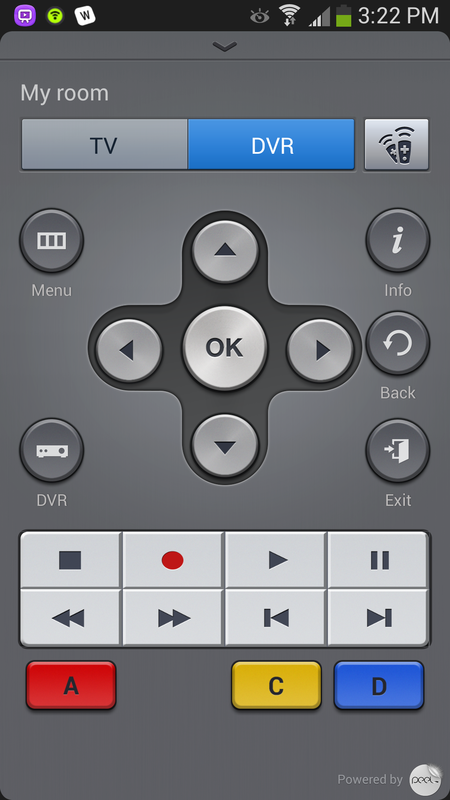 It not only recognized our television faster than any universal remote we’ve ever owned, but it also controls my DVR so I can watch recorded shows and use my phone to fast forward through the commercials. I can also turn down the volume on the television when my husband turns it up too loud. For some reason he’s not a fan of the WatchOn app. I think he’s probably just jealous that my phone is smarter than his. Oh, wait, I mentioned there were two features that would have you oozing with envy, so don’t go anywhere just yet. The second one is the absolutely amazing Swype keyboard option for entering any form of text on your phone, from sending an email to updating your Facebook status, it works with every feature of the device. Here’s the thing. I’m not good with touch screens, especially touch screens that are smaller than a tablet, so when I learned about the Swype option I nearly jumped for joy. You literally swipe your finger across the screen and it intuitively fills in the word(s) you want in nearly flawless fashion. I can honestly say this is my most favorite feature of the Samsung Galaxy S4 and I will never send a text or email without it. Now that I’ve written a novel about all the reasons I love my mobile device I’m sure you’re eager to rush out get one for yourself, right? The best part is that I haven’t even scratched the surface of the many amazing features and apps this phone has to offer. I might just have to share more with you in the future, just in case you need a little more encouragement. Disclosure: I’m a compensated member of the U.S. Cellular Better Moments Blogger Brigade, but opinions are always my own and I’m looking forward to sharing more of their products and services with you.